Howlers are found in the regions of tropical Central and South America. They are New World Monkeys and are aptly named for their cries that can be described as being cacophonous. When a number of them begin letting their lungs loose in concert, the cacophony can be heard till a distance of about three miles away. 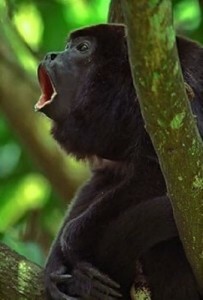 The male howler monkey is said to be blessed with a specialized vocal chamber which is shell-like. This will help them to turn up their volume so that you can hear this distinctive call. The noise will help to send out a clear message to all of the other monkeys in the region; thus telling them that this territory has already been taken over by a troop. These vocal primates can boast of being the biggest of all the New World monkeys. What differentiate them from the Old World monkeys are the wide, side-opening nostrils and the prehensile tail. The tail can almost be used as an extra arm so that they can grip branches or even hang from them. This extra-arm-like tail is an added advantage in the case of the howler monkey, because this creature doesn’t like descending to the ground too much. They will generally prefer staying aloft and munching on the tender leaves that grow higher on the trees. Male howler monkeys will use their voices to defend the turf they stand on. They will howl and they will be answered by all the other males who are within earshot. Each one of them will begin and end the day by doing a sound-check of sorts on where their nearest competitors are. This way they will also call the dips on the food in their respective territories. Given the fact that the leaves that they feed on aren’t very high on nutrition, they’d want to keep away the younger leaves that are high on nutrition. This is why the troops will want to stake claim on any such treasures that they find. When there aren’t too many competitors in the region, the pattern of the howling monkey will differ. When these monkeys were introduced into a wildlife sanctuary in Belize, their howling screams were heard only once or twice a week as opposed to the daily howls when they were in the wild. Given the fact that there was plenty of space and hardly any competition, they didn’t feel the need to check on the whereabouts of their competitors. Other than being the loudest in the animal kingdom, they also can boast of being the laziest. They are resting for almost 80% of their time. The red howler monkeys are the largest species among the 9 species of howler monkey and their weight ranges between 15 to 20 lbs. Among the New World Monkey species, these howler monkeys are the only ones who stuck to being folivores (i.e. specialized in eating leaves). 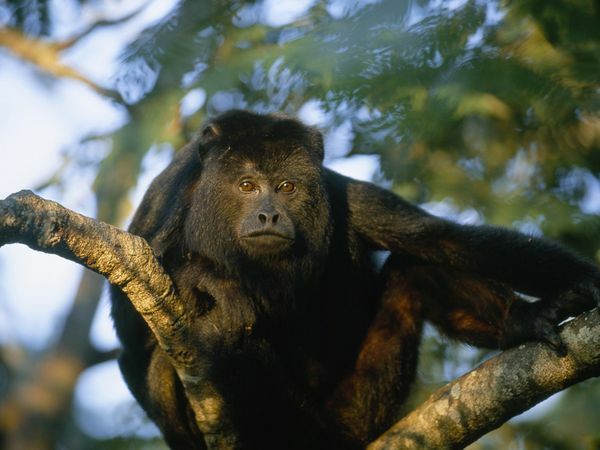 The mantled howler monkeys will use sticks to drive away any intruders in their territory. Even though these species make a lot of noise, it is extremely tough to see them when they’re in the wild.